Trim the ends off the zucchini. Cut them into 3-inch lengths, and cut each piece lengthwise into flat ¼ -inch-thick slices (you want them to be rectangular; do not cut them into rounds). Then cut the slices into ¼ -inch strips (they should look like 3-inch matchsticks). Drop the sticks into cold water and let stand 1 minute. Drain and pat the zucchini dry on paper towels. 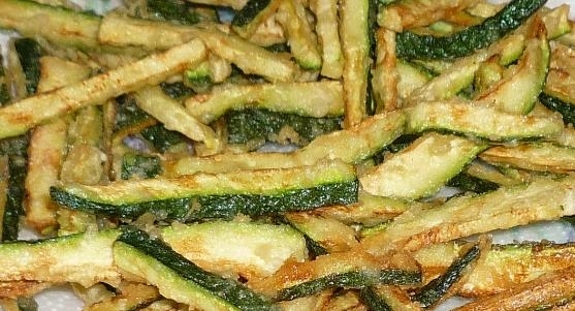 In a bowl, sprinkle the zucchini and combine them with the eggs, tossing with your hands until the zucchini is coated. Heat about 1 to 2 inches of oil to about 375°F. Fry the zucchini in batches, stirring to separate the pieces, about 1 to 2 minutes each, or until crisp. Set aside on a paper towel to drain. Sprinkle with salt and serve immediately.